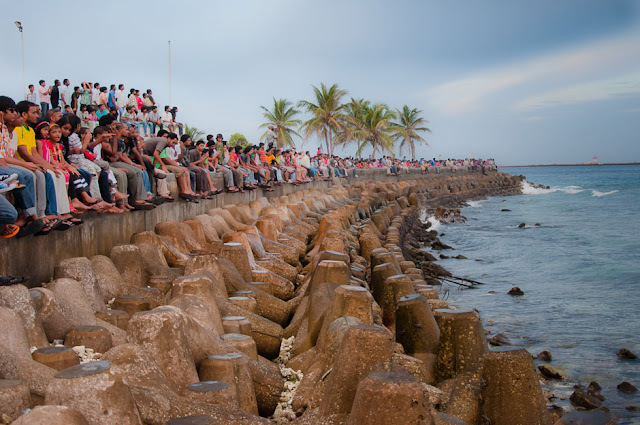 People gather at the waterfront to watch the weapons show hosted by Maldives National Defense Force. I can tell you there were a lot of people gathered at the waterfront to watch this show. There were a lot of cameras with huge zoom lenses too. With the separation of police as a civil body, the mission and duties of the NSS had to be revised. This revision envisaged a totally different turn for the organization. Hence, to carryout the newly derived mission and tasks, the core of its structure had to be modified and redesigned. All these new implementations created more of an infantry organization and was renamed the Maldives National Defence Force (MNDF), on its 114th anniversary, on 21 April 2006.
now this is a GREAT capture!! is it from the badi kulhi event? ?